One of the most dangerous weapon systems ever devised, the submarine was able to secretly stalk and attack enemy ships but at the cost of a frightful loss rate. The British, forced to operate in the shallow waters of the North Sea, Mediterranean and Baltic, lost 40 percent of their subs: 82 out of 202, 46 of them lost to Italian anti-submarine warfare. Interestingly the British subs killed a fair number of other subs (even their own); they also achieved the only submerged kill on a submerged sub. The Germans lost nine subs in 1939, 23 subs in 1940, 35 in 1941, 86 in 1942, 242 in 1943, 250 in 1944 and 120 in 1945 in five months; out of 1158 commissioned that equals a 65% loss rate. The US subs fared better loss-wise but their new boats had defective torpedo detonators that the General Board claimed were fine, leaving US subs unable to inflict much damage for two years. The German magnetic detonators were also defective; this was realized in April of 1940 off Norway and immediately corrected. The Admiral in charge of testing was ordered shot, his subordinates sent to prison for a few months to reflect on the benefits of proper testing procedures. 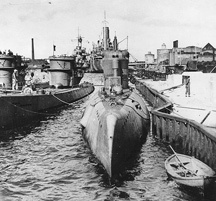 German submarines at war's end, Wilhelmshaven. The Japanese saw submarines in a different way. They considered the subs as equalizers that would snipe at larger enemies’ capital ships bringing them to parity with Japan. Merchant ships were an afterthought; few IJN subs sank more than one in their career. Their surface ship killing was fairly effective especially in 1942. Once the Allies' Atlantic ASW techniques were brought to the Pacific ship killings fell off considerably and Japanese subs began sinking at a high rate. USS England (DE-635) sank five boats in seven days in May 1944. The Japanese had the smallest true submarines, the 78-foot midgets used against Pearl Harbor, while the late-war I-400 carrier submarines of 400-foot length were the largest pre-nuclear submarines built. Other navies generally saw their subs as merchant killers, and the German wolfpack tactics had already been worked out before the war. When a sub contacted a convoy it would vector other subs to it and their multiple attacks would strain the ASW defenders; this worked especially well in the early days of the war. The Germans also relied on night-time surface attacks and spent barely five percent of a mission submerged. When Allied air attacks grew from 1943 onward the Germans sailed subs in groups of three and carried massive anti-aircraft batteries. The US pretty much copied this technique in the Pacific and Japan’s merchant fleet quickly disappeared, forcing the US to arm the subs with heavy AA batteries and even rockets so they could attack enemy coastal shipping on the surface. One advantage submarines had was the ability to attack multiple targets with a torpedo attack; whenever they were undetected and not rushed. Some submariners felt “one torpedo, one kill” was the best method and would target several merchants in a spread. Faced with growing losses the Germans employed pattern running and homing torpedoes; fired from longer ranges this meant fewer hits but lower sub losses. US also developed homing torpedoes but were running out of targets for them. The ASW forces were concerned not with sinking enemy subs (that was a bonus) but suppressing them so convoys could pass unmolested. A sub would dive at the first sign of a vessel or plane even fishing junks or Piper Cubs. Subs could not risk damage to their pressure hulls as even one hole prevents diving. That was why merchant ships had gun crews; these weapons neutralized the threat of submarine guns. Britain and the US developed ever more effective ASW weapons as the war progressed. They were able to hunt enemy subs rather than just suppress them. The following rules changes are designed to enhance the basic rules for subs and ASW in the Second World War at Sea [links to series page] game series. The sub attacks are more powerful and brought in line with other SWWAS weapon system modeling. Optional rules allow players to duplicate historical doctrines of the wars powers this reduces the wolfpack attack effect of the basic rules. Change last sentence. On a result of 6, one submarine from the flotilla is attacked. Add +1 Allied ASW after 5/43 add +2 on PB4Y Liberator. Roll a second die on the Air Attack on Submarine charts. If the ASW plane has a 0 naval attack factor two is subtracted from the second die roll. -1-0 Subtract one from Contact attempts by this flotilla on this turn. 1-2 Subtract one from Contact attempts by this flotilla on this and the next turn. 3-4 Remove one submarine from flotilla as damaged, no VP award. 5-6 Remove one submarine from flotilla as it is destroyed. Add after “ . . . every even-numbered turn” . . . except German submarines which also move every night turn. Add before sentence “On a result of 9 . . . ” Add one to the result in night attacks. If the submarine survives the ASW attack, the submarine player chooses which type of ship or (ships) the sub owner wishes to attack (which must be a type the submarine is allowed to attack, see 16.31). Place the ship counters of that type in an opaque cup (or dice randomly) and draw the target. If it is a multi-ship counter the sub player may declare he is attacking all of them if he has enough Submarine Attack Factors to do so. The submarine player rolls dice equal to his sub attack factor and on each result of 5 or greater (See Submarine Attack Modifiers Table) scores one hit. Hits caused by submarines are resolved on the Torpedo Damage Table. The different nations had certain operational rules imposed on them by their High Command. Japan never receives more than one VP for sinking a non-warship. No more than two subs may attack a Task Force in the same hex in the same turn under 16.52. The Japanese player may add one to his search die roll but the associated ASW attempt also gains a +1 modifier. Each IJN Sub Flotilla of three or more subs has one floatplane and it is used per 11.6, it is never thrown overboard. It is lost if flotilla is reduced below three subs. Rule 16.52 is usable by the German player. Once the first sub has contacted a TF each additional contact roll receives +1. The German never receives more than 1VP for sinking DD or smaller escorts if in a small counter (square), they receive one less VP than normal when sinking double-sized DD (rectangular) counters. Starting in 1943 one torpedo box is marked as FAT (a pattern running torpedo). It gets +1 to hit when used against a merchant convoy of six or more ships. GNAT (acoustic homing) torpedo is marked September 1943-December 1943 and in 1945. This works as FAT but against escorts, full VP are awarded for sinkings. FAT and GNAT are single torpedoes. Their use is optional and multiple hits are not possible on the turn used, however the ASW is -1 against a sub employing them on this turn. No additional attacks under 16.52 in a single sea zone. If a British Sub Flotilla finds itself in range (within two sea-zones) of an enemy Sub Flotilla’s reported position it may elect to roll two dice, on a 12 one enemy sub is destroyed, maximum of one destroyed sub per scenario. Additional attacks under 16.52 are not permitted in a single sea zone. In 1944 or later US subs are free to use 16.52 as written. Check out the Second World War at Sea series...CLICK HERE.